Related Post: 120225 Siwon Twitter Update: thank you so much! 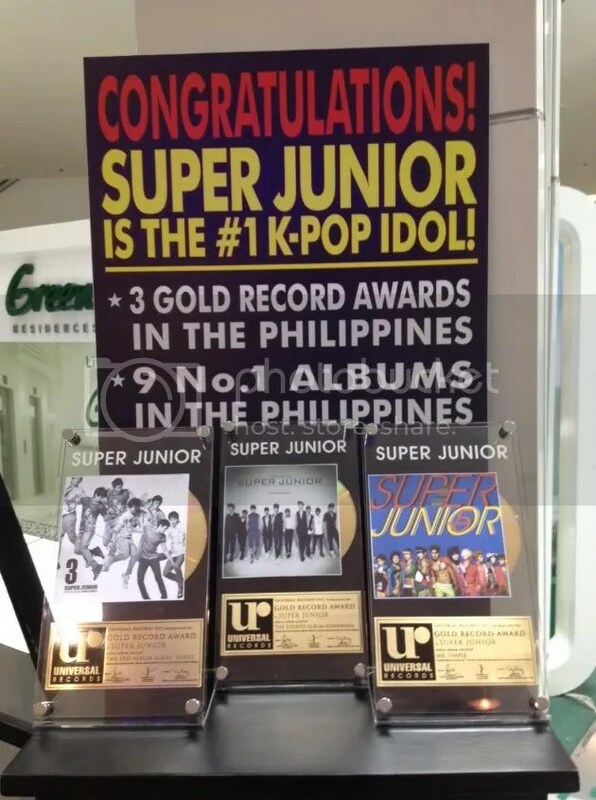 Super Junior proved that they are the #1 K-pop artist in the Philippines. They earned 3 Gold record awards for Sorry Sorry, Bonamana, and Mr. Simple. On February 25, Philippine ELFs held 2 separate events for the launching of SS3 DVD. They all gathered to share the happiness of winning the awards and also reminisce the most memorable moments of SS3 Manila a year ago. They played games and even raffled 20 individual Super Junior portraits! It was definitely a fun and memorable day for PhELFs. 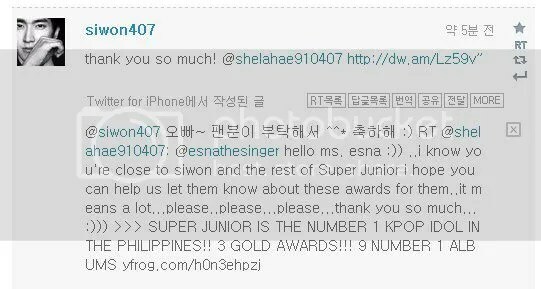 They all tweeted Super Junior members about the awards right after the events and the first one to see this was Siwon! 111006 Gaon Chart releases chart rankings for the 1st week of October! The Gaon Chart is the national chart of South Korea and is intended to be the equivalent of Oriconin Japan and Billboard in the United States. Check out the chart rankings for the 1st week of October below! ALWAYS CREDIT ‘SUP3RJUNIOR.WORDPRESS.COM’ AS WELL. Thank you. Super Junior’s 5th full-lengthed official album 《Mr.Simple》 has sailed to the top of the Taiwanese music charts, confirming their status as Asia’s super group. Super Junior’s 5th album title song 《Mr.Simple》 has successfully occupied the top position on Taiwan’s largest online music site KKBOX’s Korean/Japanese Music TOP100 charts. Following their first place win on the daily charts, they have ascended to the champion’s throne on the weekly charts [14th August – 20th August] as well, once again allowing everyone to witness the fervent enthusiasm of the Taiwanese fans for Super Junior. Previously, the title song of Super Junior’s 4th album 《Miinah》 had occupied the top position on the charts for 63 consecutive weeks, beginning from the first week of June last year until August this year. They have also become the longest-running champions on the KKBOX charts. 《Mr.Simple》 will also extend Super Junior’s mythical unbeaten run following the 《Miinah》 and 《SORRY SORRY》 fever. According to reports, even before Super Junior’s new album was officially sold in music stores in Taiwan, they have already occupied the champion position on the album sales charts for the Japanese/Korean music of the renowned Taiwanese music retail shop FIVE MUSIC for two consecutive weeks (5th August to 18th August) based on their export volume alone. Super Junior’s 5th full-lengthed album will be officially released in the Taiwanese market beginning 2nd September. On another hand, Super Junior has also conquered various major music charts in Korea with 《Mr.Simple》, and has occupied the top position for 3 consecutive weeks. Aside from that, they have also sailed to the top of music programmes such as Music Bank and M!Countdown, creating a huge wave in the music scene. Please take out with FULL and NO ADDITIONAL credits. Do not add names or blog addresses to the credits if only copying and pasting. 110824 Matal maghribi PLAGIARIZES Super Juniors BONAMANA?? Super Junior continues to break records in Taiwan’s major music chart! According to a report by Taiwanese music chart KKBOX, Super Junior has achieved the record of being the artist who has stayed the longest in the top spot of their chart’s ranking history. It was revealed that Super Junior’s song “BONAMANA” has topped the weekly Korean Music Top 100 Chart for the week of May 22 to 28, making it the 52nd week in a row for it to stay on the top spot. Already splitting their charts due to the rising popularity of Korean and Japanese music, “BONAMANA” maintains its strong hold in the top spot proving the group’s popularity and fanbase in the country. The current report is similar to their previous hit “Sorry Sorry” which has dominated the chart for the 36 weeks in a row. Meanwhile, Super Junior M has already ended their two month long promotions in the country after topping various music charts with their second mini-album “Perfection”. Idol group Super Junior has continuously occupied the top of the Taiwanese music charts for a year, creating a wonder with their unbeaten record.